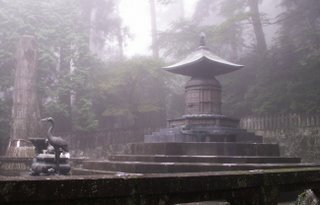 In my last post about Nikko, I left off at the sacred bridge. A short walk up the hill brings you to the first of many attractions. 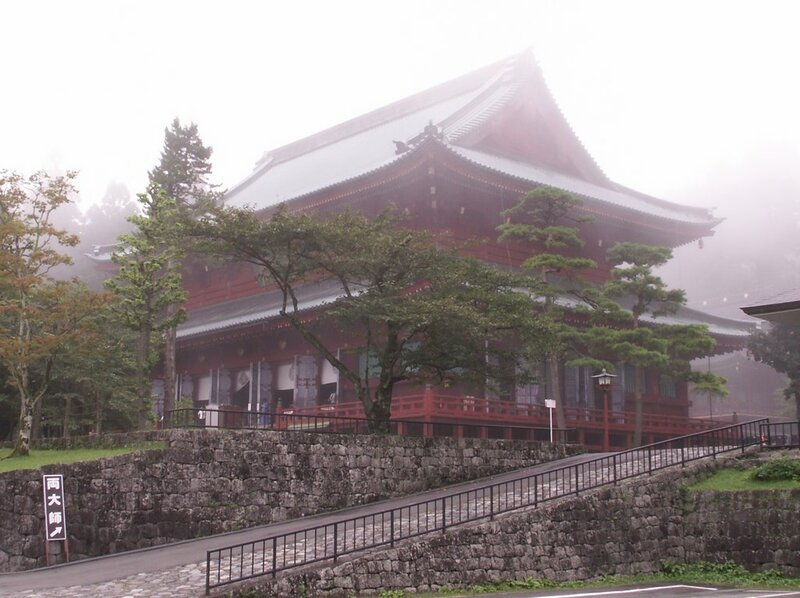 This huge temple appeared through the mist rather suddenly. If you ignore a few of the details like the modern signs and guardrails (and all the other tourists) you could almost believe you were looking at the temple a few hundred years ago. This temple happens to be the home of a rather large golden Buddha statue, but there are multiple signs (and people) warning you not to use a camera once you get close to the temple. Moving on a little further there’s a large bell similar to what is found at many temples. I later noticed that this was one of the least ornamented structures in the area. Yet a close look shows considerable carving work. 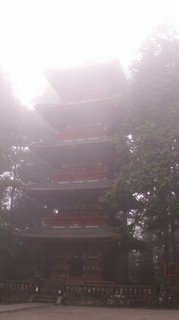 One of the better known structures here is the 5 story pagoda. 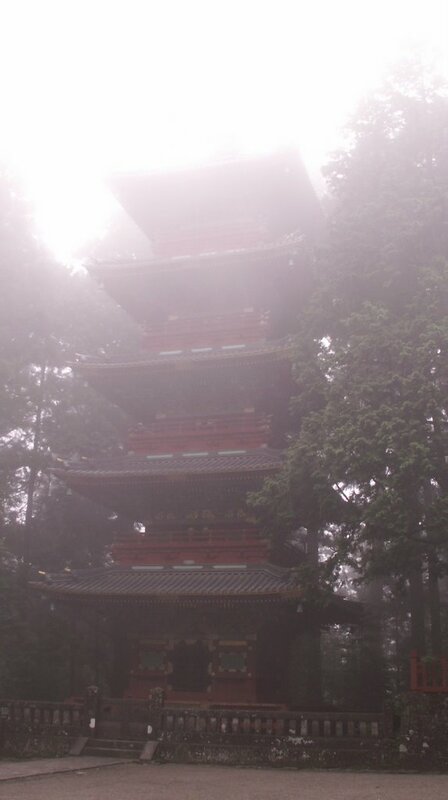 It’s not that 5 story pagodas are unheard of in this region of the world. Quite the contrary; it’s the unusual construction style that makes this pagoda interesting. Rather than build a large lower level and repeatedly reduce the footprint of the floor above, all of the levels are the same size. This keeps snow from building up on all of the lower levels, which is important at this altitude. There’s another unique feature to this too. It has a sort of an earthquake protection feature. 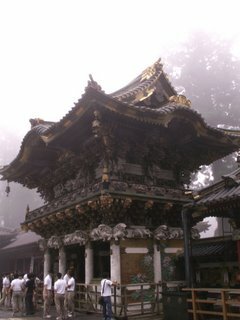 A large wooden column was suspended by ropes inside the pagoda; the idea being that in an earthquake, this would help to dampen the swaying of the building. Once again, if it works, it would be important in this location. The clouds made it impossible to capture the entire thing, but you can see a little from this shot. 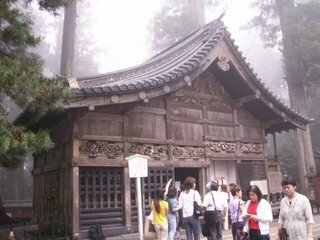 Here’s a picture of the sacred stables of the Toshogu shrine. Around the stable you will see multiple panels of carvings. 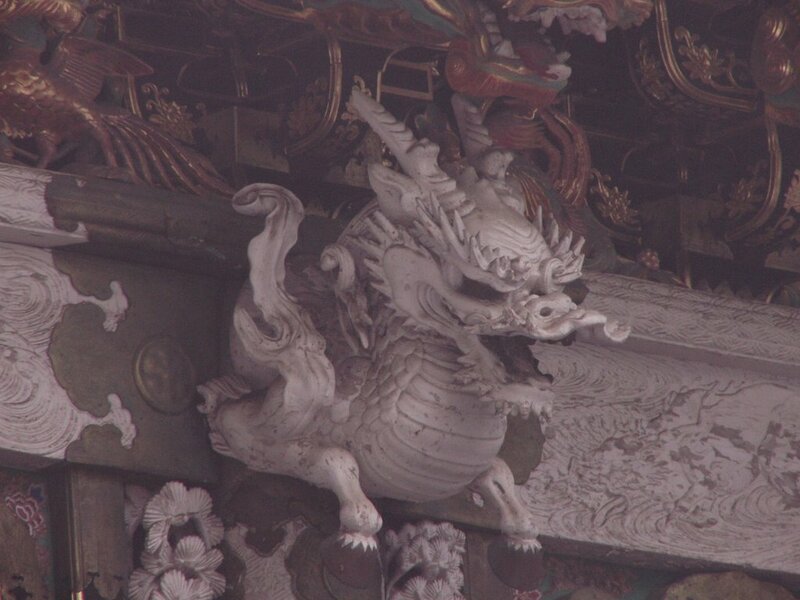 The monkey is thought to be a natural guardian of horses, so it was a natural choice for decorating the building. Each panel depicts a group of monkeys living a particular style or type of life. 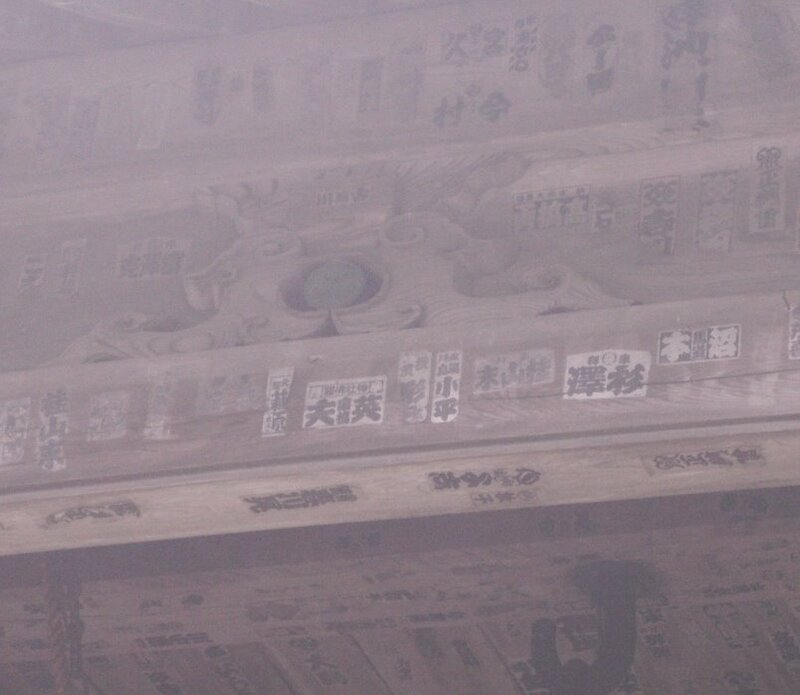 The most famous of these carvings panels is the three wise monkeys who see no evil, hear no evil, and speak no evil. Yet when you zoom out a little you realize that it would take forever to examine everything here. This is the Yomeimon gate, with over 500 carvings it is one of the most ornate pieces of work in the Toshogu shrine. It is also known, after translation, as the gate where people spend all day looking. I can certainly see why. This would probably be a photographer’s paradise if it weren’t for two details. First, EVERYONE thinks it’s a photographer’s paradise and so the place is loaded with tourists like me trying to get shots of all the buildings and there’s usually no way to get an unobstructed view of a subject. Second, you’re not allowed to take pictures of many things here. Just in case you forget, there are multiple signs and people reminding you all the time. Of course, even though you can’t take pictures, the local vendors (many of whom are actually set-up inside these beautiful buildings) are more than happy to sell you picture books that show you everything. I couldn’t do a post on this town without at least one picture of the thing that made it truly famous. 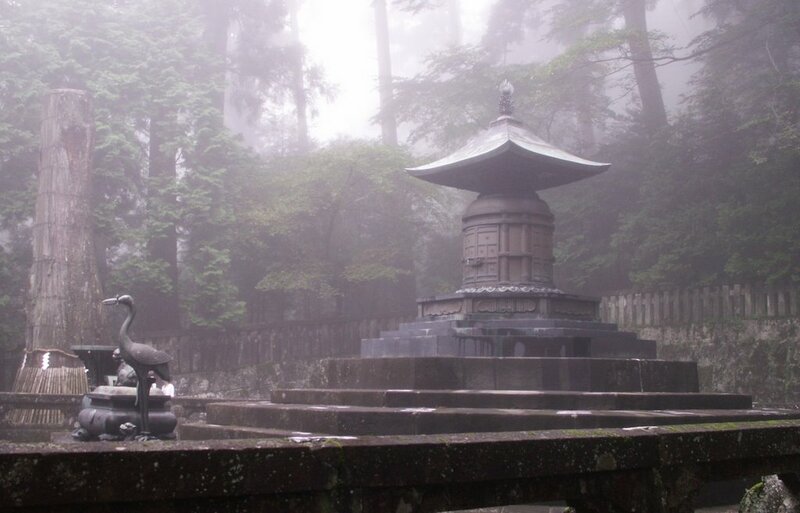 This is the final resting place of Shogun Ieyasu Tokugawa the great unifier. Were it not for his presence (or rather, the presence of his remains) this great memorial to the strength and wealth of his family would not have been built. 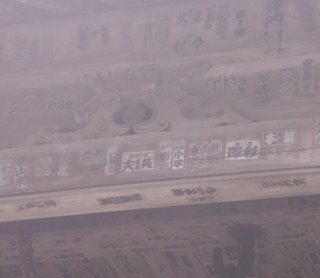 This can be seen at the top of a very long set of stairs. One of my party members told me that he counted 272 steps; most of which were about 12 inches tall. I don’t think he really counted, but nobody really wanted to call his bluff by trotting all the way back up the hill to count. There are a few more pictures left from Japan, but that will have to wait a while longer. If you want to learn more about this area and see pictures that were not taken on a hazy day, then try the official website of the Nikko tourist association (in english). I love the pictures! The fog actually makes it look really cool. 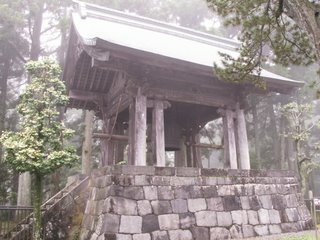 I didn't think it came across so well in the photographs, but the ornate structures, and the massive cedar trees in the mist gave it a really surreal feel. I was just going to say the same thing- I like the fog. Great pictures!